The Hill Country of Texas is known for many things. The beautiful wildflowers, the great hiking and camping, and plethora of wineries are some of the wonderful draws to the area. Peach season and lavender season are another! The idea of combining fresh peaches and lavender into a jam made my mouth water just thinking about it! Imagine spreading this over freshly baked Buttermilk Biscuits! This recipe makes about 7 8-ounce jars. Place lavender in a small heatproof bowl. Pour boiling water over flowers. Let steep for 20 minutes. Strain, reserving liquid. Discard lavender. In a dutch oven, or large pot, combine lavender infusion, peaches and lemon juice. Bring to a full boil over high heat, stirring constantly. Add sugar in a steady stream, stirring constantly. Return to a full boil, keep stirring to dissolve sugar. Immediately stir in pectin. Return to a full boil. Boil hard for 1 minute, stirring constantly. Remove from heat and skim off any foam. Stir for 5 to 8 minutes to prevent floating fruit. Ladle peach mixture into sterilized jars, leaving 1/4 inch of space from the rim. Wipe off any excess jam that may have spilled. Apply lids and rings and tighten (fingertip tight). What a lovely combination. Two of my favourite things! Oh yes, would love some of that jam on a biscuit. The peach and lavender are a wonderful combination. wow, you are good Kenley. Bet this is great. You can eat lavender? Say no more…yummy if it tastes as good as it smells. You sure can, Laurie!! And it does taste as good as it smells. The important thing to remember though is moderation — a little bit of lavender goes a long way (too much and it overpowers everything else). The hill country of Texas is beautiful but I never knew it was famous for lavender. Oh, does this sound good! 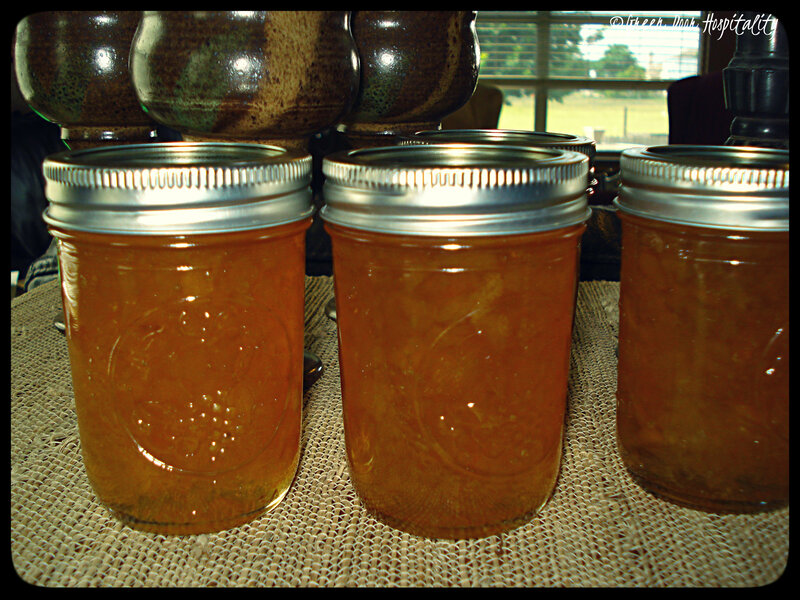 I love peach preserves and with the addition of lavender, your recipe has to be a can’t miss. Never thought of a peach and lavender combo before, but now that you mention it, it sounds delightful! Mmmm that sounds amazing! I need to find a lavender farm and just fill my arms with bundles of the stuff. I would put it on and in everything. I have a few lavender sachets in my clothes, but the dried flowers are quite old so they’ve lost most of their scent. Next time I’ll have to try it in food! It’s a shame I only visited Houston five years ago. As Texas is such a large state there must be the most amazing towns and places to visit. Besides, there’s so much food I never got the chance of tasting! Mmmm there really is nothing better then a homemade jam on a warm biscuit!! You’ve given me a craving… and a reminder to get my canner out!! This sounds delicious! I love peaches — and lavender. Sounds soooo good! I love lavender… and peaches!!!! Beautiful! I love a good peach jam but I’ve never made it with lavender – must try it this time! Nice combination! I have just started making my own jams but have stuck to strawberries and blueberries for now. This is a great summer idea! This entry was posted on August 8, 2013 by Jessica Romigh in Pantry Preserving and tagged 250 Home Preserving Favorites, canning, gluten-free, homemade preserves, jam, lavender, liquid pectin, peach lavender jam, peaches, preserving, Texas Hill Country, vegan, vegetarian.